The great thing about being of a certain age is not having to give a damn about having to prove ones abilities in audio design. Challenge me if you wish but you will be challenging thin air. I won't reply (ignorant bugger!... ). I originally wanted to produce a two transistor phono stage which had served me well, but as it would not meet with the expected specifications of the day, I started off making op-amp based products which could. Making op-amps do the sound my ears were accustomed to has been a veritable pain, but many hear with their eyes, by which I mean specifications. The thing is I can't blame them. There are so many charlatans who would sell you garbage if it were not for the checks and balances that a proper declared specification calls for. And if the specification conveniently leaves out the basics of frequency response, sensitivity, distortion and noise, then I guess such designers don't have an audio analyser. It is hard being able to afford a good calibrated audio analyser on a £60 a week start-up grant, but a very kind gent in the local radio trade let me borrow an ageing one on "permanent loan". These days I have a state of the art software driven Audio Precision. Simulation helps, but doesn't tell the complete story an audio analyser will often ruthlessly reveal, destroying ones dreams and aspirations. Simulation and measurement should therefore go hand in hand. So suitably armed with anti-bullsh*t equipment I am now able to revisit my "cuddly" transistor configurations so laboriously developed by the earlier pre-op-amp generation, which I am partly of. The shunt series pair has contributed so much to so many over such a long period of time that it should be considered as a worthy contender for one of the best sounding transistor circuits of all time. It has featured in many amplifiers and preamps: Dynaco; Naim; Philips; Tandberg; Teleton... these being the ones I know about; and also the 'unconventional' voltage amplifier stage of my Proprius power amplifiers. Had I gone the conventional route the Proprius would do 35 watts, but then it wouldn't sound like it does. Sacrificing just 1.46dB of power allowed the use of the shunt series pair resulting in better sound in my opinion. In the example shown (taken from Art of Electronics) it is cited as a high speed amplifier as used in high frequency work. In audio however, it takes on a slightly different appearance. Q2 as shown contributes gain decided by R4/R5; Q1's gain R2/R3; stage gain (R7/R3)+1; and signal gain R6/R1. It has a total of 4 negative feedback paths, and in this form might only give 10dB of overall gain (x3). 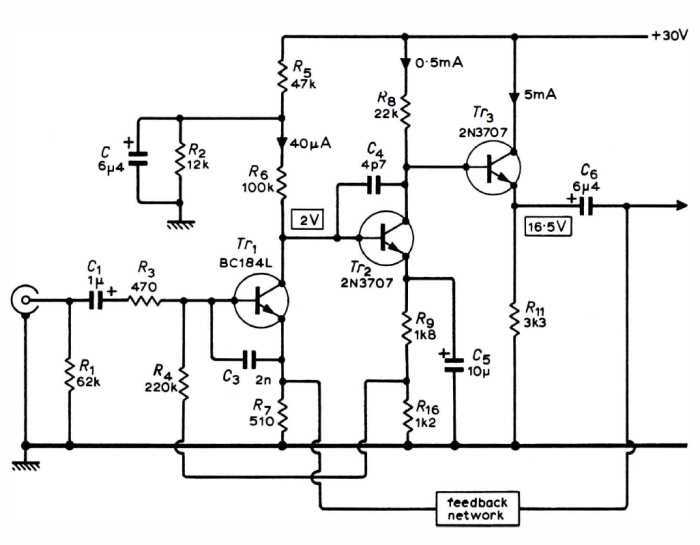 Should R5 be shunted by a suitably sized capacitor it then only has one negative feedback path: (R7/R3)+1. Disconnect that and it is capable of gains 1,000 and above (60dB plus). Give it a suitably high voltage supply - I am only talking about 25 volts upwards - and its gain goes up even higher, so with negative feedback applied, its distortion comes down and so does its noise. Transistor gain, ignoring other circuit losses, is approximately 40 times the collector load's voltage drop, so you can see the two transistors work together to bring about a large open-loop gain. As shown here it is also missing an important component: the compensation capacitor required for high frequency stability. It goes between Q2's collector and base, and swamps miller capacitance which is parasitic to all devices, not just transistors. Leave that out and it oscillates and won't behave very nicely. The shunt series pair also features in this circuit as TR2 and TR3, but you will note that R23 is not shunted by a capacitor. Its gain therefore isn't very well defined ((R20/19)+1), and the danger here is instability because R23 lets it behave as a high speed amplifier. The compensation capacitor (C7) is too small to contain it, and the lack of 'solid' negative feedback means that its output impedance is high. Not the sort of thing you want driving the following Baxendall tone control. R24 saves the day by lessening the load, preventing oscillation, but at the expense of tone control boost. At time of publication (1975) I was still grappling with how transistors work. I am a mechanical engineer turned electronics engineer (like Mr Vereker...?). 43 years on and it's easier to spot such errors. And in 1975 circuit simulation was just a dream. The authors, a couple of service engineers, did rather well because even with its shortcomings it sounded particularly good. You should be able to see the shunt-series pair of transistors (Q101, Q103) again driving a tone control stage (Q105), and this was the arrangement in numerous commercial products throughout the 1970s. When dedicated hi-fi products started to emerge, stages like Q101, Q103 above started to be served up as modular boards within specialised line stages or preamplifiers, or incorporated in amplifiers without the tone controls as the new trend in hi-fi swept them away. Here the stage is used much like an input valve would be used, to switch sensitivity, and equalisation for the phono input, and it dealt with all inputs. The difference being that with transistors having a more well defined and predictable gain, the switching network components proved more precise. With an input valve which didn't have much gain, and gain differed from one valve to the next, RIAA equalisation was approximate and not very accurate. RIAA was also a new thing in the days of valves as it came to be phased in from 1953. Any deviation was compensated for by tone controls, provided the user had a clue as to how it should sound. The shunt series pair changed all that because of its high gain and more importantly its repeatability. The negative feedback network (same as valves) could have its accuracy tightened up to give greater precision. Because of this precision stereo was more viable because of improved left right channel matching, and stereo also brought an end to the stuffy old way of pushing speakers into room corners, and people started to arrange them into neat equilateral triangle positions to hear the stereo effect. So thanks to transistors hi-fi stereo became much more of a reality for many more people (lest we forget). With transistor current gain (Hfe) being in the reliable region of 100 to 200 (although most of the time it's a lot higher), and the first transistor needing to run with 50uA to 100uA of collector current for low noise with a moving magnet input, the next transistor collector current can only be 10 - 20 times this. Why not 100 - 200? The second transistor would consume all the current of the first transistor and would be impossible to bias, so we only "draw" 10% as a maximum - a "rule of thumb". That lengthy introduction was necessary to show that the second transistor can only operate at roughly 500uA to 2000uA depending on which transistors we choose, that translated into milli-amps is 0.5 - 2 mA. 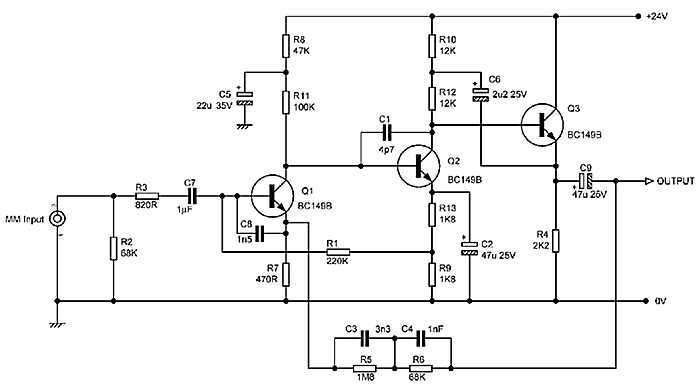 The second transistor is responsible for driving the negative feedback EQ network who's impedance falls greatly at high frequencies, and taken to extremes (which hi-fi should) it can be seen in the earlier circuit that R113, a 10k resistor, drives R109, a 560 Ohm resistor. Small current cannot drive big. However, the same negative feedback lowers the effective output impedance so it is considerably lower than 10k in practice, but in the process the negative feedback is used up, and the result is distortion affecting the highest frequencies. 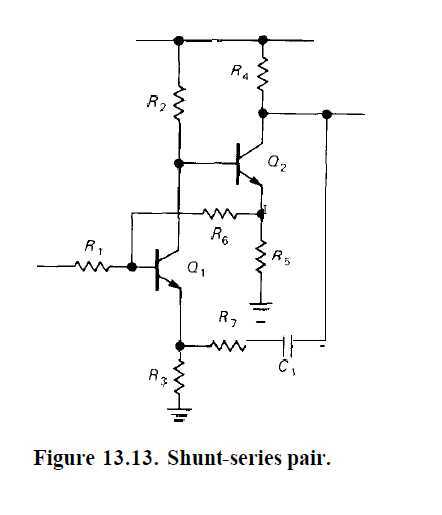 This is why you find the argument that transistors are no good at high frequencies because they distort so much, and in the two transistor shunt-series pair used like this it is a correct assumption. But the argument has been falsely extended to mean all transistors. Used like that it is complete fabrication. We know however that such as a TL071 op-amp (in hindsight that is) can be made to drive an RIAA negative feedback network, and still have enough drive left for a following stage. That does 6mA. Then there is the 16mA of the good old NE5534 and its derivatives, designed to drive down to 600 Ohms (as found in telecommunications). But here I am indulging in 1970s transistor design, before the introduction of such good op-amps. It therefore looks like two transistors can't hack it? So what about three? From what I said in the above introduction it should be possible to reach 20mA? It is better however to ease the load on each stage to minimise distortion. This being class A one side of the signal will tend toward flat-bottoming because a simple "pull-up" resistor cannot source current all that well. The resulting distortion of "flat-bottoming" is second harmonic (highly prized by valve users) so a 1kHz signal will be accompanied by a smaller 2kHz facsimile, and I want that so small that my Audio Precision analyser tells me it's 0.02% or less. By spreading the load, making each transistor do less than 10 times the current of the preceding one, it might work. So if the first transistor did 100uA, the next transistor would do say 1mA or less, and the third would do say 10mA. In wanting the lowest possible noise which was of great boasting value, H. P. Walker in Wireless World, May 1972, decided on a first stage current of just 40uA; a second stage current of 0.5mA, and a third stage current of 5mA. The third transistor here can be seen to be an emitter follower, which provides no voltage amplification (the other two provide sufficient) but provides current amplification. And with that it was possible to make a truly high fidelity moving magnet phono stage using transistors. It might not be able to technically compete with today's op-amps, but if you were to compare it you just might like its sound. 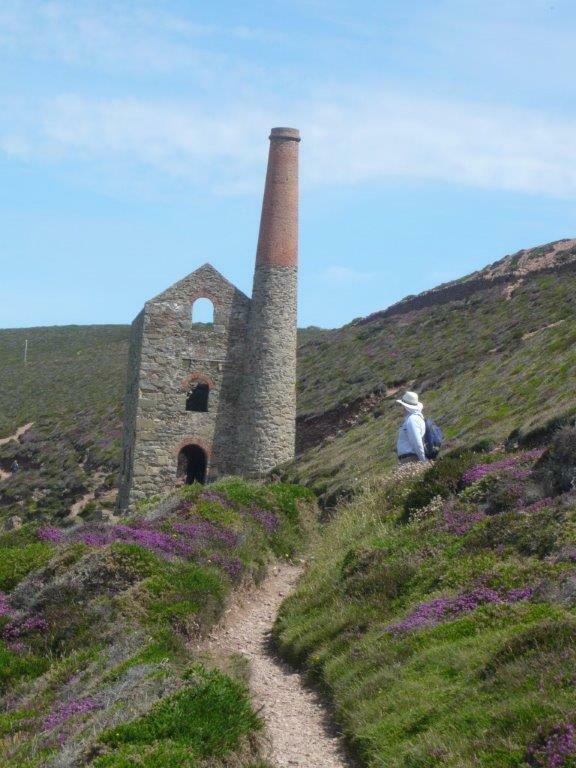 I'm quite fascinated by this, brings back many memories. If I might join the nostalgia, that reminds me very much of an integrated (though we didn't use that terminology then) amplifier I built in the mid 60s, from an article in good old Wireless World, perhaps by Linsley-Hood? All built point to point wired on paxolin sheet with "Vero" pins. the volume and tone controls were all stepped attenuator built on Elna wafer switches. Power amp stage was if I recall BD139/140?? PP, all housed in an aluminium U channel and perforated steel enclosure measuring about 8"x 4"x 3" with outboard power supply. Speakers were Wharfedale Kit 3, the DIY version of the Dovedale. It all went very loud and served me well until the early 80s, when a couple of caps and transistors (by then obsolete) failed, the speakers lasted well into the 90s. Ian, you are welcome to join the nostalgia, and so are others with an interest in transistor audio circuit configurations. A.C. Ainslie told me it was based on a Sinclair preamp and TR1 was added as summing amp for the mixer. Whether that is true or not I couldn't say. The BD139/140 of your power amp would be output drivers, which could have been 2N3055 TO3 outline, which were quite popular at the time? The BD139/140's have stood the test of time, and I couldn't imagine making a driver stage without them. Last time I left you with H.P. Walker's version of the shunt-series pair. It added a third transistor which increased output signal current. Now, it's over to Doug Self. Mr Self must be the most prolific contributor to British audio design this world has ever known. His "doctrine" has appeared in print often in Wireless World since the 70s. Think of almost any famous British amplifier brand and I'm sure Doug Self played a part in their designs. He is also the author of many books on audio design, and without them many a designer will have missed a trick or two. Mr Self specialises in ultra-low distortion, and so once good op-amps became available, moved-on from transistors - as did quite a few British manufacturers at what seemed to be exactly the same time! By adding a bootstrap which is C6 from Q3's emitter to the half way point of H.P. Walker's 22k resistor - becoming two 12k resistors - the output signal appears across R10. The top of R12 is therefore pulled up and down in sympathy reducing the tendency to "flat bottom" which reduces the second harmonic. And I can vouch for what Mr Self says in that it reduces distortion by a factor of 3. There is a danger however in adding a bootstrap in that it can play havoc with the lower bass response, and here I am grateful for SPICE simulation. Without it one could blindly carry on like numerous British designs (power amps included) did with a lower bass hump! This being due to the sum of other low frequency cut-offs elsewhere in the circuit, and due to negative feedback, or the lack of it at low frequencies tending toward open-loop gain, boost via the bootstrap. In this circuit C6 is 2.2uF for a reason! Next we will have a look at how each transistor affects the other and see if we can improve where Mr Self left off.